GPs have highlighted innovative work by nurses in knitting together health and social care for frail older people. 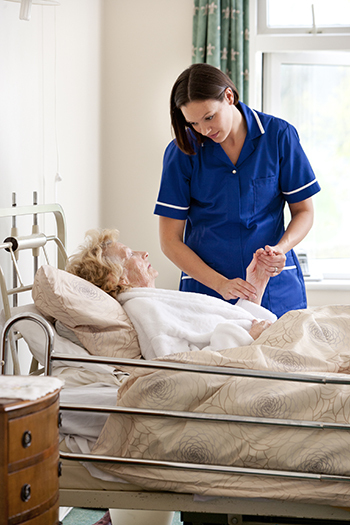 A report by the Royal College of General Practitioners and the British Geriatrics Society describes how nurses are taking part in schemes run by GPs and geriatricians, to provide integrated care. The report includes 13 UK case studies. Some feature ways of helping older people remain independent and active, others focus on improving hospital care or community services. The report also describes partnerships between GPs and geriatricians, as well as important work by nurses. Community matron Nicola Gelling is part of the care home innovation programme (CHIP) in South Sefton in Merseyside and covers 17 care homes. She links with GPs and a geriatrician by phone or video conferencing to provide fast access to services and care planning, which patients would have previously missed out on in the past. Care homes in the area have NHS videoconferencing facilities, which connect a geriatrician to Ms Gelling during office hours. Out of hours they link to a senior nurse. The idea is that if residents are seen quickly and given thorough care plans they will be less likely to need hospital admissions. Ms Gelling says that the videoconferencing works in the same way as Skype – she uses a laptop to dial a geriatrician so the two can discuss a resident with chest pains or respiratory problems, for example. The report says that the CHIP scheme has contributed to a 23% reduction in North West Ambulance Service conveyances. In Midlothian, advanced nurse practitioners and a community psychiatric nurse work with professionals such as GPs and geriatricians to provide a hospital-at-home service. This ‘virtual ward’ in a person’s home provides nearly all the help a hospital would provide, but without having to go there for admission. Approximately 90% of patients are referred by GPs and most are over 75. Patients typically have renal problems, heart failure, or respiratory difficulties. The team generally has around ten patients on its books. Sharon Dempsey is one of five advanced nurse practitioners (ANPs) in the team. The ANPs do an initial assessment and decisions on patients’ care are made in partnership with doctors. About one in five patients are sent to hospital after a nurse’s initial assessment. A nurse may visit a patient two or three times a day. She adds: ‘We are a new batch of nurses and there is a combination of acute and community nursing. If I put up fluids for a 90-year-old woman who lives alone I have to make sure there is a family member or a neighbour who can come in. The team do not have all the equipment an acute hospital would and are currently lobbying for a bladder scanner. Patricia Cantley, a consultant in geriatric medicine at Midlothian Health and Social Care Partnership, spearheaded the scheme, which began in 2014. Have more primary care support. Have contact with primary and acute care professionals as a team. Before the setting up of an integrated community ageing team (ICAT) in March 2014 there were 44 acute admissions a month from care homes in the London borough of Islington, which has ten care homes. The report noted that because the homes are run by five different private trusts, there was little communication and sometimes duplication. The majority of care home staff do not have nursing training. ICAT worked with GPs and other community services to provide integrated care for care home residents in the most appropriate setting for them. The team aimed to maximise days spent in the care home by carrying out comprehensive geriatric assessments and planning for treatment escalation. After ICAT was established the average number of care home residents admitted to Whittington Hospital fell by 26%, leading to an 18% reduction in bed days from care homes. Care home managers and patients have praised nurses working for the South Sefton CHIP scheme, the report states.